Moscow Mayor’s Ouster Renews a Query: Who Is Really Running Russia? The Cold War has been over for years, but its two capitals — Washington and Moscow — are going through similar political storms these days, both having managed to lose their mayors. The mayors, Yuri Luzhkov of Moscow, and Adrian Fenty of Washington, fell victim to different political opponents. Luzhkov was fired by Russian President Dmitry Medvedev. Fenty was ousted by the Democratic Party primary voters of Washington, D.C. But the reason for their dismissals was similar — the people who did the firing thought the mayors had gotten a little big for their britches. If Fenty was the portrait of a modern American mayor — bi-racial, bike riding, marathoner, reformist — Luzhkov was a classic old fashioned pol whose tough political style would remind many Chicago residents of the late Richard Daley. While Fenty’s defeat didn’t register much beyond the Beltway, Luzhkov’s firing has stirred a new bout of Kremlinology in foreign ministries and think tanks around the world. And that’s because it once again raises questions about who is really running Russia. The order to fire the Moscow mayor came from Medvedev, responding apparently to an article Luzhkov wrote in a Russian newspaper complaining about weak national leadership. Luzhkov’s major complaint was familiar to followers of American municipal politics — the cancellation of a highway project between Moscow and St. Petersburg following rare protests from environmentalists who said it would have destroyed an ancient forest. But whatever the triggering event, Russia analysts are asking: Who pulled the trigger? 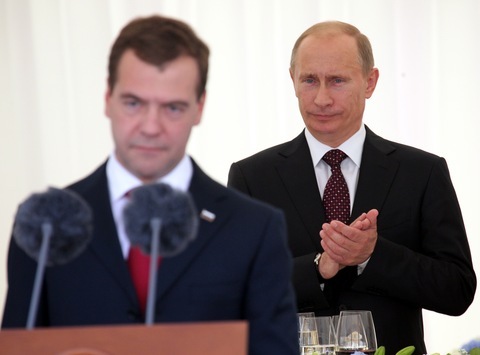 Was it really Medvedev or was the hidden hand of Prime Minister Vladimir Putin involved? Gati added that the most important issue for the Russian leadership, even as everyone acknowledges a leadership rivalry between Putin and Medvedev, is the fear that Russians and outsiders perceive an open split. Luzhkov’s complaints about Medvedev’s leadership, while seemingly praising Putin, definitely exacerbated that divide. Seen from Moscow, she said, apparent leadership fights in such former Soviet republics as Ukraine and Kyrgyzstan lead to political upheaval, which the Russian leaders fear above all. Medvedev is mulling a list of potential replacements for Luzhkov, but one Russian journalist offered another twist. He thinks the former mayor is trying to organize a campaign to turn the Moscow mayoralty into an elective office, which he assumes he would win. If the experience of Washington is any indicator, that could be a long wait. It took the U.S. democracy the better part of two centuries to award limited self rule to Washington residents. And, as Fenty would remind Luzhkov, elections don’t always turn out the way mayors might expect.